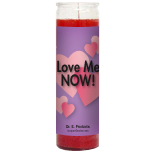 I want to say that this candle was working for me before I got the report. My boyfriend started acting so loving and concerned even said he been thinking of getting me a ring and buying a home for us. Everything I have purchased from Dr.E has defiantly worked thus far!! I am a lifetime customer! My report said successful!! Date Added: 06/20/2017 by D. M.